CLOSING RECEPTION: SIFTON GALLERY - THURSDAY JANUARY 25, 2018 From 5:30 - 8:30. All are invited! 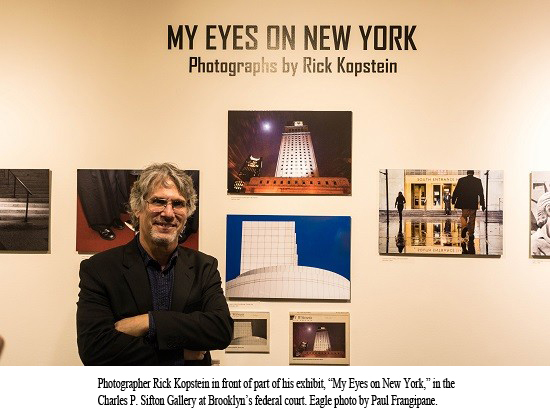 Dozens of members of the legal community came together at the Charles P. Sifton Gallery in Brooklyn’s federal court Thursday night to celebrate the opening of the legal eye, Rick Kopstein’s photography exhibition. “My Eyes on New York,” showcased 84 photographs from around New York City and namely within the judicial community, taken throughout Kopstein’s career at the New York Law Journal. Photos of the courthouses themselves, the people that make them work and the individuals that give the city a face are all represented on the walls. The story goes -- a 14-year-old Kopstein found his father’s old 35mm camera and together they built his first darkroom in their basement. “Little did I know it at the time, but for the rest of my life I would have a camera by my side,” Kopstein wrote in the exhibit’s description. Kopstein was then drawn to the action of 1960s New York City and eventually studied photography at the School of Visual Arts, committing to becoming a professional photographer. “This exhibition celebrates the twenty years I spent as a photographer for the New York Law Journal. I came to know the people, the events and the buildings in which the law continues to be the primary topic of discussion,” Kopstein wrote. At the exhibition, judges and clerks could be seen admiring pictures of themselves and colleagues, looking back on memories. “It’s really an honor to have been selected to have the show and I’m really happy that everyone seems to be enjoying it and it’s really kind of a confirmation of my years working for the New York Law Journal, which was the best job I ever had really,” Kopstein told the Brooklyn Eagle. Kopstein now spends his time between Tucson, Arizona and New York City. The exhibit will be open to the public until January 25, 2018. A closing reception will be held at the Sifton Gallery on Thursday January 25, 2018 from 5:30 - 8:30. Open to the public.